Why Chocolate Hills is special ? The Chocolate Hills are a group of unusually shaped hills located in the middle of the island of Bohol in Philippines. This extraordinary landscape is unique to this small island. It is unknown how many chocolate hills there are. It is known that at the bare minimum there are 1268 hills but some estimates put this number as high as 1776. Mystery still surrounds how the Chocolate Hills were formed. One of the more popular local legends is that long ago, two giants fought for days, hurling earth and stones at one another, until they fell exhausted, friends once more, into each other's arms. More romantic is the handsome young giant, Arogo, who fell in love with a mortal woman. When, as mortals must, she Chocolate Hillsdied, the giant wept, his great teardrops turning into the Chocolate Hills. However geologists have differing views about how these hills were formed. Whatever their origin, being in their presence is a surreal experience, and as landscapes go, one of the most bizarre you can encounter. 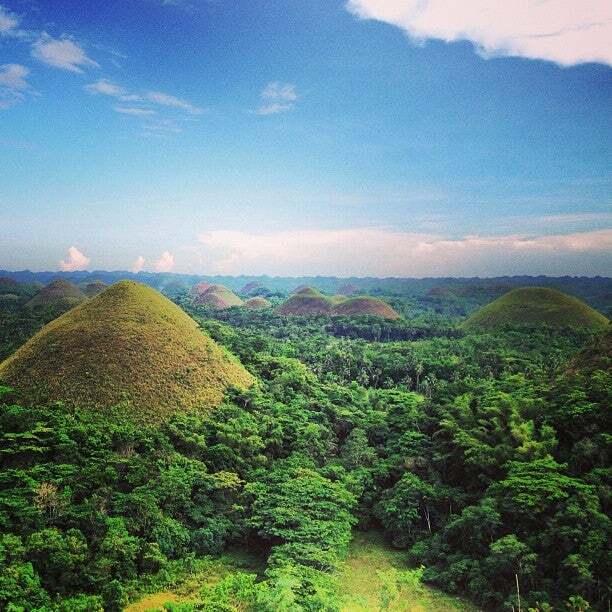 The Chocolate Hills now are a famous tourist attraction of Bohol. What to explore at Chocolate Hills? The Chocolate Hills are considered one of the natural wonders of the world. This place can be visited anytime of the year as they will be just as spectacular during the rainy season as during the dry one. Due to their uniqueness the Chocolate Hills cannot really be compared to any other tourist attraction in the Philippines and offer one of the most remarkable examples of conical karst topography, anywhere in the World. You can view the Chocolate Hills from two main sites, the Chocolate Hills Complex located in Carmen or from the newer tourist spot of Sagbayan Peak. Both locations offering a great vantage point. How to get to Chocolate Hills? Plenty of tourist guides and tour operators will be happy to bring you to the Chocolate Hills, either as a separate trip or as part of a day tour. If you want to go here on your own, from Tagbilaran, you will have to go the integrated bus terminal in Dao and catch a bus going to Carmen. Make sure it is the first one to leave, and ask the driver to drop you off at the Chocolate Hills complex, about 4 kilometers before the town of Carmen. From there it is a 10 minute walk along a road winding up to the complex. It's best to visit early in the morning to avoid the busloads of tourists. From the base of the viewpoint, motorcycles can whisk you up the hill (P40 one way for two passengers), or you can also walk up the hill (20 to 30 minutes). Usually visits to the hills are short ones as there is not much to be done besides viewing them. Fun ATV and buggy tours are also available near the base of the viewpoint. You can stop on the way for a visit in one of the Tarsier centers and drive through the Man Made forest. You should note that the hills cannot be climbed individually and there is only a viewing deck from where you can marvel at the scenery around. To get a really good view there are 215 steps up to a viewing platform from which there is a 360 degree vista. The location of the hills however, is quite far from the other attractions so you have to bear with the roadtrip. They're hills. Don't expect carnival rides. But the view at the top is really incredible if you go on a clear day. Buy this tour in the common package that also includes the tarsiers, man-made forest, butterfly garden, and river boat. This saves money and all are worth seeing. Back to the hills. They are very old, and nobody seems to know how they were made. There are over a thousand of them, and the only like them are here on this island. A cool mystery that comes up on television shows about the worlds wonders and uh, mysteries. So go see them while you enjoy this wonderful island in the Philippines and then you can say you were there when your kids are watching it on TV. The slight sight of the world famous Chocolate Hills are simply astounding! No words can describe how majestic this God's-creation is! There are a lot is stairs. Plan your trip when the hills are actually brown if not they won't have the chocolate color. It's still a pretty view.